The problem with trying to write something after my father’s death is not a lack of words. Rather, it’s been a struggle to figure out how much I can stand to say. Thank you all for your condolences. Your kindness meant a lot to my family and me. I spent seven weeks at Dad’s bedside and traveled back to Chicago for a few days. Dad’s situation changed dramatically within those few days and I had to turn around. Wouldn’t you know it – my flight was delayed and I was hung up at JFK for five of the longest hours of my life. My sister met me at Baggage Claim in the Buffalo airport shortly after midnight and I was waiting for my suitcase when a nurse called to tell us Dad was dying. I tried to urge the conveyor belt along with my boot heel (does not work) while Sister #1 called Sister #3 and told her to pick up our Mom. We made it to the nursing home at 1:05 AM, which was a late Saturday night or early Sunday morning depending on your point of view. From the entrance I could see my brother sitting in the family room and a nurse met me at the door. She pursed her lips and shook her head back and forth slowly. That is how I found out my father had died ten minutes earlier. He was still but warm when I went into his room. Folks have asked me what happened to my father and how I’m doing. The best short answers are that he died of respiratory failure due to Chronic Obstructive Pulmonary Disease (COPD), and I am going through the normal stages of grief. 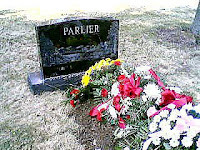 Dad pre-arranged his funeral in March 1999, ten years to the exact month of his death. He picked out his headstone, too. It’s a polished black stone (“I can see my reflection in it!” he said), etched with the image of a fisherman flanked by two deer at a cabin on a lake. My father’s favorite decorating theme could be called “sportsman chic”. The stone compliments his deer rugs, the bear lamps in the living room and the stuffed trout that used to hang on the wall above the refrigerator. It is wonderfully terrible.